The Kameleoon.API object contains a certain amount of useful data about running A/B tests. These data could be used to manage, for instance, other A/B tests. The Kameleoon.API.experiments object contains all data on running A/B tests. It is an Array object for which tableau.Kameleoon.API.experiments will return for instance the data about the first test on the table. targeting : Indicate if you are targeted or not. Take the true or false value. subconditions : contains the targeting setup details. value : contains, for instance, the URL used for a URL targeting. id : contains the variation ID. name : contains the name of the variation. deviation : contains the percentage of traffic allocated for the variation. customVariable : number of the custom variable used. tracker : Google Analytics tracker used. By default, this parameter will not take any data and will have as value the Google Analytics tracker by default, "gag_". atInternetTracking : contains the AT Internet parameters. adobeOmnitureTracking : contains the Omniture SiteCatalyst parameters. eVar : eVar number used. object : Omniture tracker used. By default, this parameter does not take any data and has as value the "s" tracker. 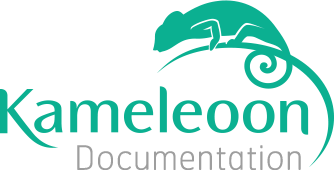 kameleoonTracking : contains the setup parameters of Kameleoon reporting tool. mainGoalId : main goal ID to measure for statistical significance. originalLandingPage : first page visited URL (landing page). originalReferer : original URL of the user's visit on your website (original page). startTime : date at the beginning of the visit (UTC timestamp). endTime : date at the end of the visit (UTC timestamp). pageviews : amount of pages seen during the visit.